When this arrived in a recent estate lot, I went eeek ! and then promptly contacted our favorite repair shop. Although we can make minor repairs and alterations here at our store, we leave something like this to a professional that has experience with Native American jewelry. A jumble of beads and a broken wire – I wonder if everything is here to make a necklace again??!! The 14 mm handmade beads are stamped on both side and so are the blossoms – quite rare ! As usual Henry did his magic – straightening any bent blossom petals, balancing all the beads beautifully, making a new hook and eye closure….resulting in a treasure of a necklace. The repair shop we use……. I have a squash blossom necklace made with hearts. I have searched your blog and the internet and have not found this shape. Can you help me determine if this is in fact a rare-type shape? 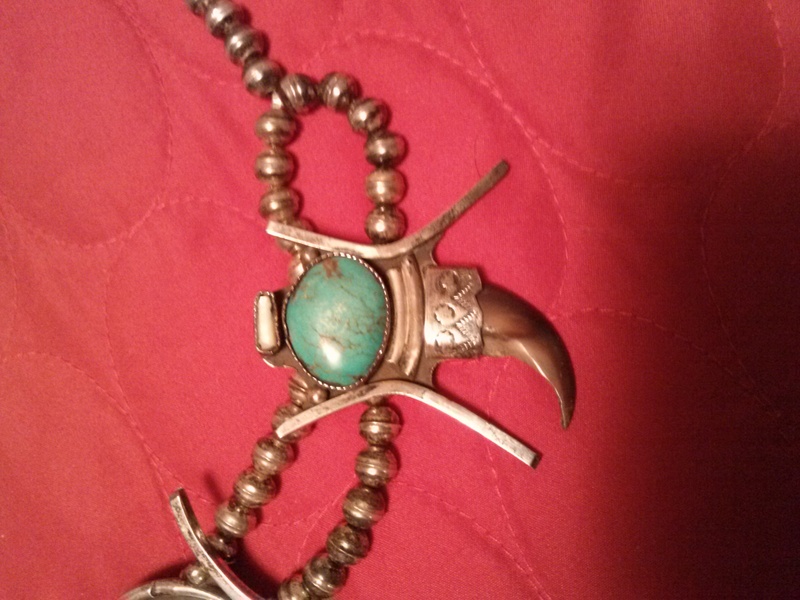 Also, can you help me determine the type of turquoise? 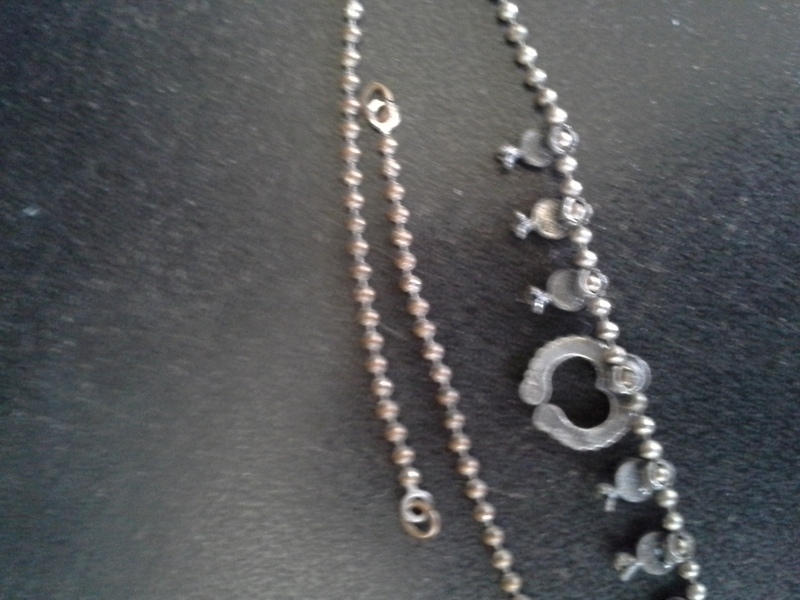 And, my clasp is broken, do regular jewelers repair the clasps, and the way they repair, does it make a difference or lessen the value? Like soldering vs. wiring vs.gluing? I would interpret the design element as clouds rather than hearts. Possibly this could be King’s Manassa turquoise but it is hard to say for certain. 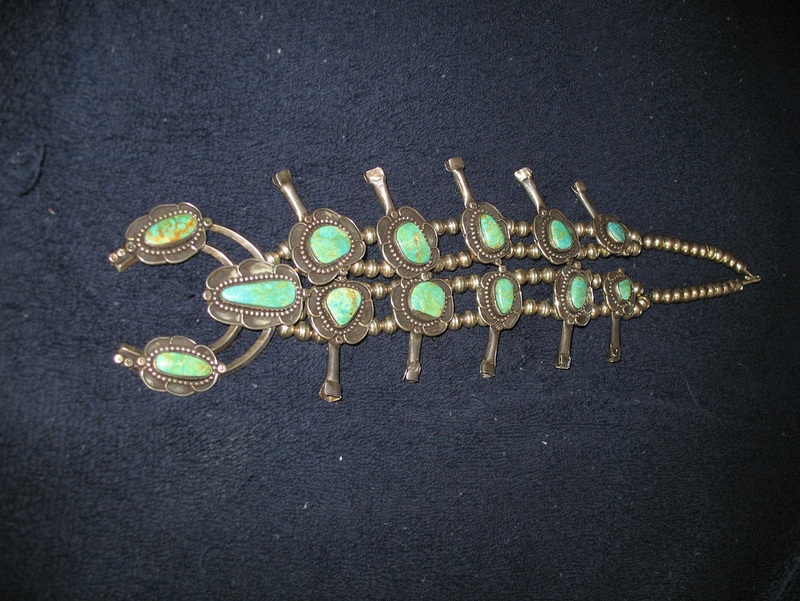 As far as repairs, I would recommend that you have any repairs done by an experienced, knowledgeable jeweler that as worked on vintage Native American jewelry so that the repair would be consistent with the original piece. We don’t do repairs here but we recommend this business for Native American jewelry repairs. They do all of the repairs for our store and we are thoroughly satisfied with their work. Petite Squash Blossom Necklace – have you ever seen one? I have a petite squash blossom that I’ve never seen another like it. Measures 12 1/4″ end to end, the naja is 1/2 x 1/2″. How you ever seen one this small? Maker? Here is a small Navajo made squash blossom necklace – it is 16 inches long and made with 3 mm beads. You can see how small it is by the dime in the photo – similar scale to yours I’d think. I am hoping you can help me out. I have two squash blossom necklaces. One is from my mother (late) and is a cool mother of pearl that I remember she told me that she purchased in the 70’s. 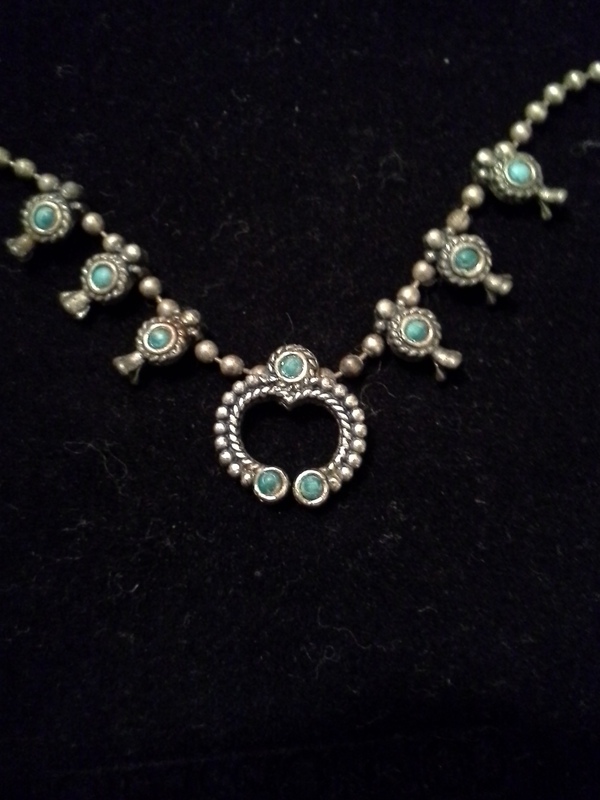 The other, in blue turquoise, I acquired at a resale shop about ten years ago. I have decided to finally pull them out and start wearing them and would love to know more about them. I can’t find a stamp on either one of them. I don’t see an artist and I don’t see a silver marking either. I have taken a few pictures and would love to hear your opinion. Also, is it fashionable to polish or not polish these necklaces. Also, does it affect the value if I chose to have them lengthened or shortened? Thank so much in advance. Without a hallmark, about the only thing I can say about your two lovely squash blossom necklaces is that they are vintage Navajo. As to their silver content, that is something you can test with an acid test kit or have them tested at a pawn shop. As far as polishing, that is a matter of personal taste. You could leave as is, clean or polish with a cloth, or completely restore as you see fit. Here is more information about cleaning jewelry. In terms of adjusting the length, yes it would likely affect the value. 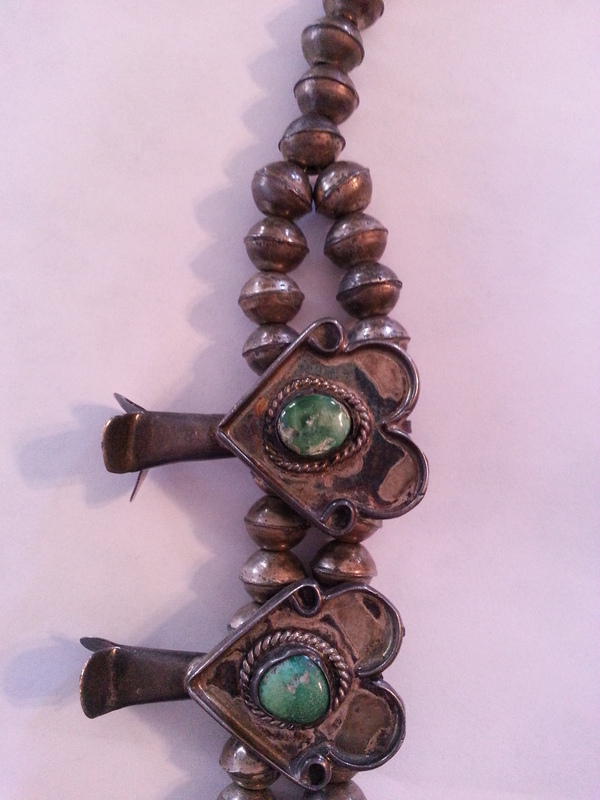 For a collector, leaving a squash blossom necklace the traditional length would be best. But for “using’, depending on who did the alteration and how they did it, a shortening might increase its “value” because then it would be wearable art! Watch for my next post which will show a squash blossom necklace that I had shortened so that I could wear it more as a “choker” than a long necklace. Real Bear Claw Necklace – can you tell me anything about it? Without seeing the hallmark, I can’t say for sure. 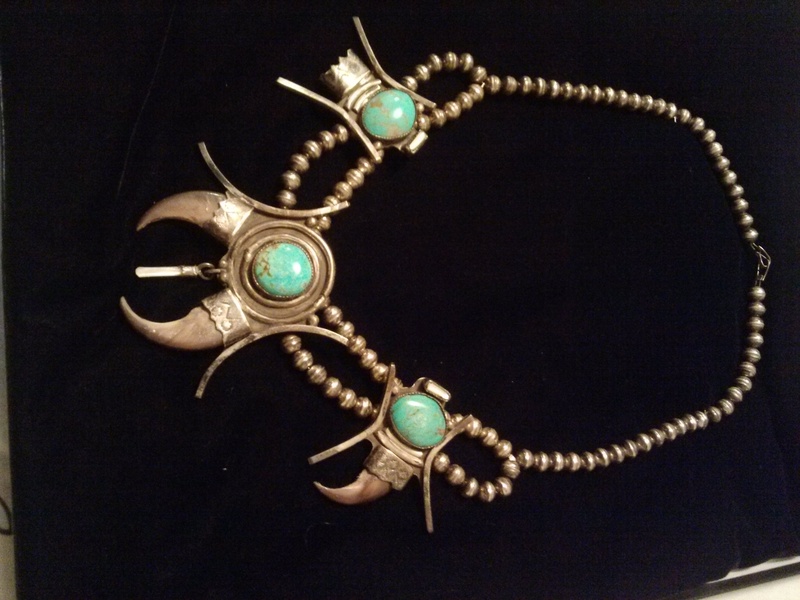 There are several Navajo silversmiths in the Craig family. If you would like to send a clear photo of the hallmark, that would help. What is that hanging down between the two claws of the drop? Can’t quite get a fix on it. I’m thinking it might be a piece of Mother of Pearl (MOP) to coordinate with what appears to be MOP set above the turquoise on the two sidepieces. 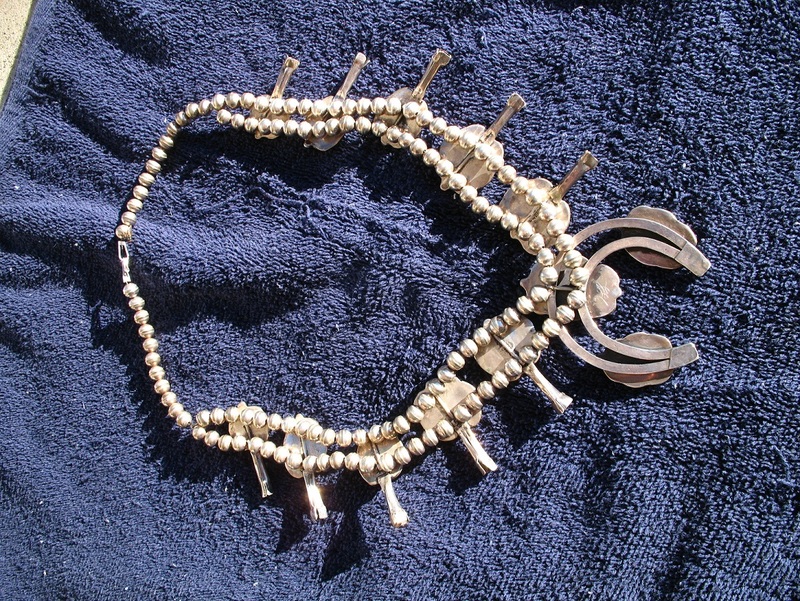 The assembly of this necklace is not typical. The curved reinforcements are unusual. I wouldn’t call this a squash blossom necklace. Although it is true, it is strung on double silver beads typical of squash blossom necklaces, that is about where the similarity ends. Below is a traditional squash blossom necklace complete with squash blossoms. What is this green necklace worth? I recently inherited a necklace that my grandparents bought in the early 1970’s. It has at least 40 years of patina built up on it and a maker’s mark on the back that I think is “HL”. I took it to a jeweler and she told me that is was indeed entirely made of sterling silver, handmade and that the turquoise was real. It has spent that better part of the last 20 years in a safe deposit box and, if I keep it, it will stay there until I die. It is something I will never wear and have no strong sentimental ties to it. I cannot find anyone that can tell me who made it, how much it might be worth and how I can sell it for its true value. Can you help me? Here are two photos of my necklace. The only marks I can find on it is what appears to be a cursive “HL” etched on the back. There is at least 40 years of patina built on, possibly more. My grandpa bought it for my step-grandma in the early 70’s and my mom said she doesn’t think it was ever worn by her, but I do see some signs of wear, edges that are worn smooth, so it may be much older. I really don’t know anything about it and everyone who would is long dead. Is there anything you can tell me about this, who made it, or anything that might make it particularly special or rare? Navajo Squash Blossom Necklace – What is its history and meaning? So because of that, there was a lot of Native American jewelry made at that time, some very nice and some kind of quick to feed the demand. Paula – What is my Squash Blossom Necklace Worth? As far as your necklace, it is fairly typical of the time. 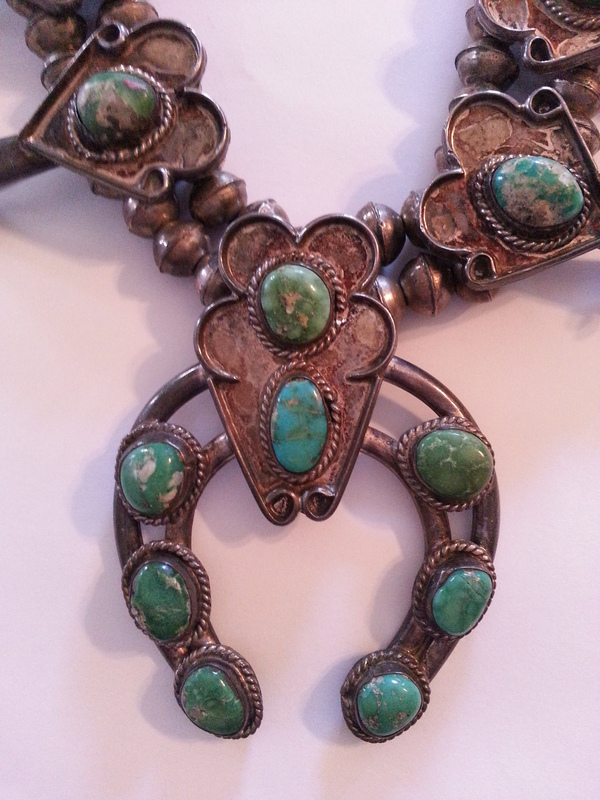 Although you only sent one photo of the front of the necklace, I can see that the stones are a very nice green turquoise, except for perhaps the one in the upper position which appears quite blue. That could be how it was originally made or it that stone could have been replaced at some point. 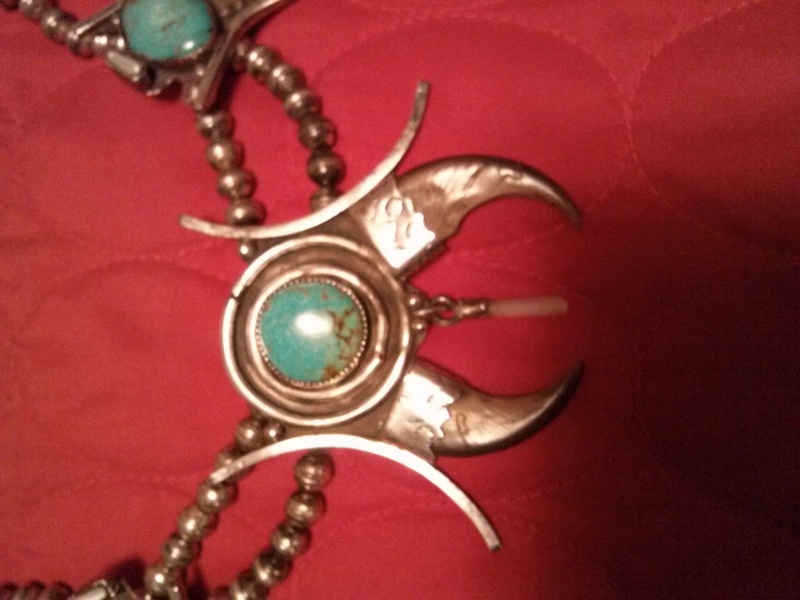 Most of the squash blossom ends do show damage but they can be repaired by a Native American jeweler. I couldn’t make out the inscribed hallmark well enough to verify and there have been a number of Navajo artists with the initials HL over the years.